Clip ‘n Climb, international leader in the fun climbing market, acquired by Entre-Prises in 2017, is poised to step up its presence in the global sportainment sector, following the acquisition earlier this month of US-based Fun Spot Manufacturing LLC by parent company ABEO. Georgia-based Fun Spot specialises in supplying equipment such as trampolines, ninja courses, climbing walls and boulders for amusement and entertainment parks around the USA. With a 40-year heritage, the company, holds a strong position in the sportainment industry (activities combining sport and entertainment), has a diverse, loyal customer base of franchisees and independent park owners, and is expected to achieve revenue growth of $40 to $50 million in the current financial year. 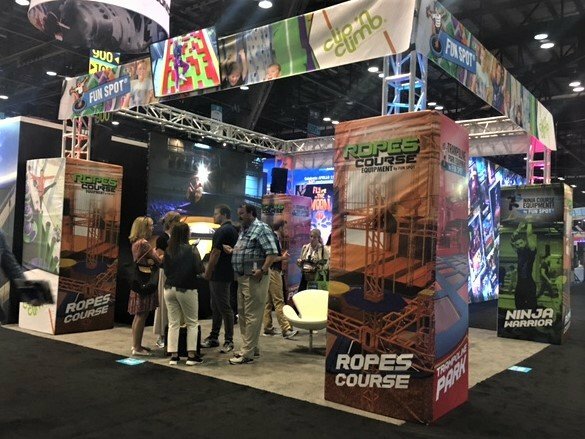 This new acquisition will see Clip ‘n Climb increase its reach into the USA market, partnering with Fun Spot to offer quality fun climbing walls and equipment as part of its portfolio, which includes 460 trampoline and ninja parks worldwide. Clip ‘n Climb currently offers facility owners and investors more than 40 colourful and unique indoor and outdoor climbing challenges designed to appeal to all age groups. Since the very first centre opened in New Zealand in 2005, Clip ‘n Climb has revolutionised indoor climbing. Its theme park meets climbing wall concept has been thrilling and challenging people of all ages, extending the appeal of indoor climbing to a mass audience and creating a new sector in the leisure industry that has gained in popularity all over the world. This is a game-changing move for Clip ‘n Climb, as it will drive the company’s global expansion plans. Significant growth has already been achieved during 2018 with new facilities launched in Portugal, Brazil, Poland, Oman and Denmark, with 44 sites additional in the pipeline. North American expansion is on the horizon, and the new partnership with Fun Spot will support and contribute to success in the region. Article written in collaboration with TOAST PR.